Space is the ultimate canvas for the imagination, and in the 1950s and '60s, as part of the space race with the United States, the solar system was the blank page upon which the Soviet Union etched a narrative of exploration and conquest. 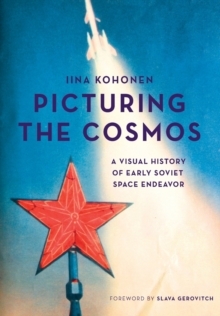 In Picturing the Cosmos, drawing on a comprehensive corpus of rarely seen photographs and other visual phenomena, Iina Kohonen maps the complex relationship between visual propaganda and censorship during the Cold War. Kohonen ably examines each image, elucidating how visual media helped to anchor otherwise abstract political and intellectual concepts of the future and modernization within the Soviet Union. The USSR mapped and named the cosmos, using new media to stake a claim to this new territory and incorporating it into the daily lives of its citizens. Soviet cosmonauts, meanwhile, were depicted as prototypes of the perfect Communist man, representing modernity, good taste, and the aesthetics of the everyday. Across five heavily illustrated chapters, Picturing the Cosmos navigates and critically examines these utopian narratives, highlighting the rhetorical tension between propaganda, censorship, art, and politics.